If you select the Export Diagram Images option (above), click on the drop-down arrow and select the image format to export to. Select from metafile, bitmap, .gif, .png and .jpeg. 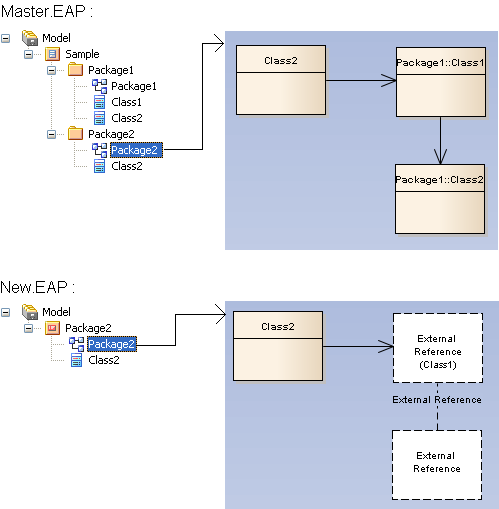 A sample scenario would be, as shown below, exporting Package2 to XMI 1.1 from Master.EAP and importing it into New.EAP - the Classes Class1 and Class2 and the connector between them are shown using a placeholder on the diagram Package2. If the file is for a package under package control or version control, and this checkbox is not selected, it is overridden if the For all packages, create placeholders for external references checkbox is selected on the Version Control Settings dialog and/or Package Control Options dialog. Type in the location of the default XML directory to use when importing and exporting XML, or click on the [ ... ] (Browse) button and browse for the location. Click on this button to save the changes you have made, and to close the Options dialog.